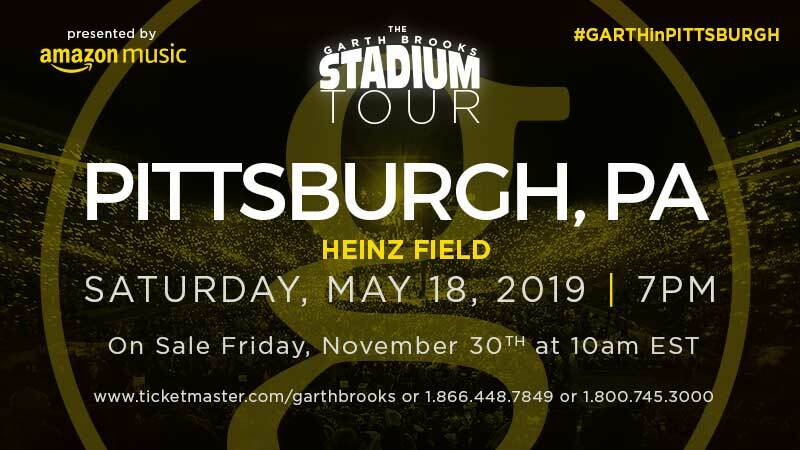 LOS ANGELES- November 20th, 2018- The Garth Brooks Stadium Tour is coming to Pittsburgh, PA. The concert will be Saturday, May 18th, 7:00 PM at Heinz Field.The tour is presented by Amazon Music. Recently, Garth sold out the first ever concert at Notre Dame Football Stadium. The concert, "GARTH: LIVE AT NOTRE DAME!" was filmed for television and will air on CBS, December 2nd at 8:00 PM ET/PT. Garth's The Anthology Part III, LIVE, is out today! It's an exciting, detailed, insider look at the electrifying concerts of Garth Brooks, with behind-the-scenes stories, insider secrets, and interviews with band and crew. It contains 5 CDs with 52 live recordings, never before seen photographs and 10 augmented reality experiences that can be seen on the Garth Live app. It also includes the new live album, TRIPLE LIVE. It's the soundtrack of the record breaking, number one tour in North American history. Pittsburgh, PA will be in-the-round staging. Tickets will be on sale Friday, November 30th at 10:00 AM EST. There will be an eight ticket limit per purchase. Tickets can only be purchased at ticketmaster.com/garthbrooks or either Ticketmaster Express 1-866-448-7849 or 1-800-745-3000. Please note there will be no ticket sales at the venue box office or Ticketmaster outlets on November 30th. Tickets will cost $76.79 plus a $4.00 facility fee, a service charge of $7.25 and a $6.91 tax for a total of $94.95. All seats sold are best available.